My previous visit to Bang Bang Food Hall in Colindale opened my eyes to the massive variety within regional Chinese cuisine and left me curious to try more. 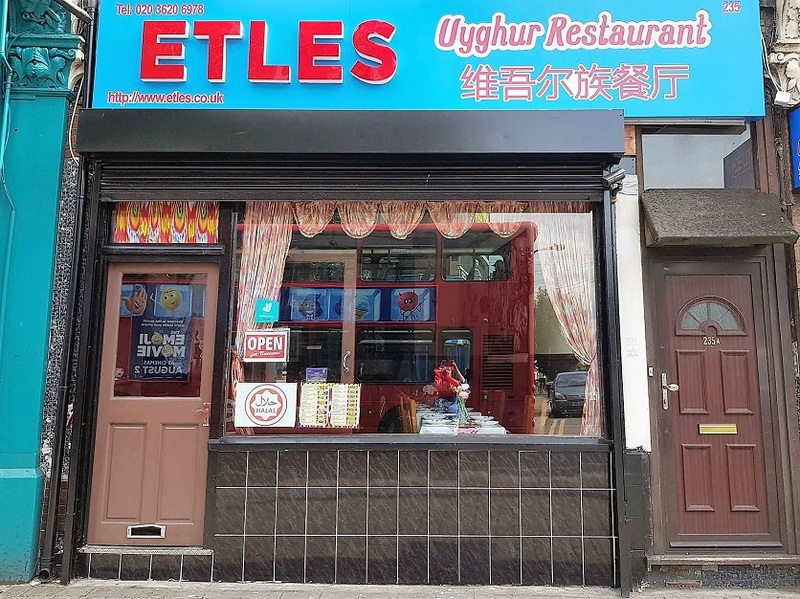 Luckily, on a recent trip to Walthamstow I was able to further explore at Etles, a restaurant which specialises in Uyghur food from Northern China. 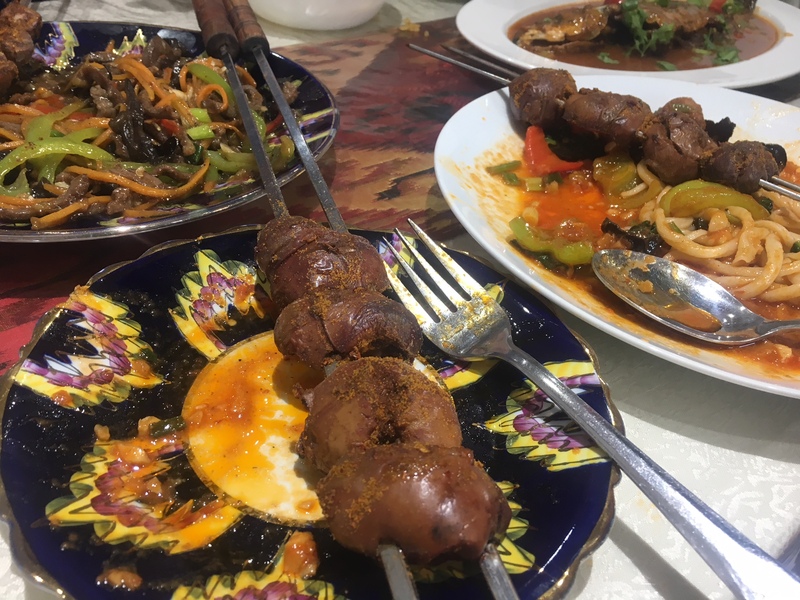 A fascinating mixture of all the influences along the Silk Road (smoky, burnt aubergines, cumin flavoured meat skewers and hand-pulled noodles), Uyghur cuisine is a wonderful mash up of many flavours you probably wouldn’t think were traditionally “Chinese” at all. When presented with the menu, the inclusion of pictures is extremely useful, as every dish was very new and unfamiliar. 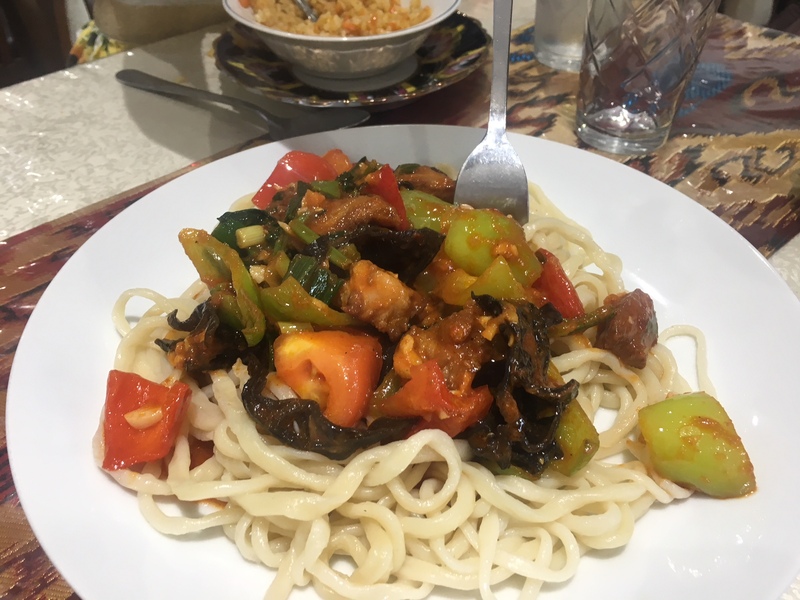 This may well be your experience on visiting too, given that Etles was the first Ughur restaurant in London (there’s now one more in Finsbury Park). But don’t worry- the helpful staff are more than happy to give recommendations and make suggestions. Sharing between three, we chose the Hong Shou Yu (marinated seabass with mixed fresh herbs), the Lagman (handpulled noodles with stir-fried fresh beef and vegetables) and Liang Ban Niu Rou (beef marinated in fresh herbs and spices served with bell pepper and vinegar sauce). The menu is also very offal heavy, so we felt inclined to throw some kidney kebabs in there too. The lagman (below) is recommended as a must-try on the menu, and it was definitely the stand out dish of the night. The hand-pulled noodles were cooked al dente and made the perfect, carby base for the mix of beef and veggies in a rich, cumin-spiked tomato-y sauce. Ginger and garlic stood out as strong flavours that tied the soft beef together with the various vegetables in the dish. As an offal enthusiast, the beef kidney kebabs were right up my street. Sprinkled with a cumin salt, these were rich in flavor with a pleasantly chewy texture. The seabass, just peaking through in the left corner in the photo below, came in a thick sweet and sour sauce which I really liked, however overall this dish lost points due to the bone-meat ratio of the fish. Lots of small bones and not enough fish = frustrated diners. The second beef dish with the herby, vinegar-y sauce was good but lacked the delicious hand-pulled noodles and rich sauce of the lagman. Top left is the Liang Ban Niu Rou, with the seabass just peeking through on the right. Kidney kebabs and Lagman noodles too. All these new and exciting plates brought about familiar flavors but combined in a way I’ve never tried before. It’s not just unlike any Chinese meal I’ve ever had but actually unlike any other cuisine; the melting pot of cultural influences on this region make for a great cusine. All this, and I’ve not even mentioned one of the restaurant’s main draw…it’s BYOB! So don’t delay any further. Pick up your favourite bottle of wine, head on to the end (or beginning?) of the Victoria line and have a meal at Etles. This is Chinese cuisine unlike you’ve ever eaten, and well worth trying.